The Urban Bikeway Design Guide provides cities and their downtowns with state-of-the-art techniques for creating complete streets that are safe and enjoyable for bicyclists. To create this guide, the authors conducted an extensive worldwide search for design guidelines and real-life experiences. They worked closely with a panel of urban bikeway planning professionals including traffic engineers, planners, and academics with deep experience in urban bikeway applications. Required: Elements, which are necessary for successful implementation. Recommended: Elements which add value, but are not required. Optional: Elements that vary across cities and may add value depending on the situation. 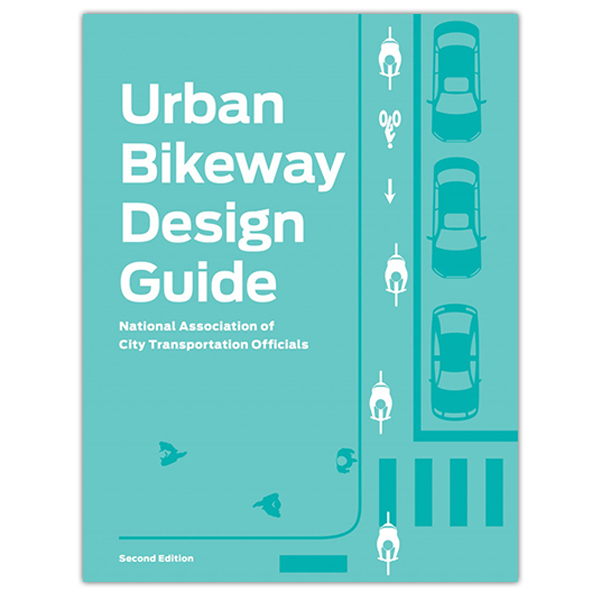 Fully illustrated with color photos, diagrams, and 3-D renderings of wide-ranging best practices, the Urban Bikeway Design Guide is essential reading for city officials and downtown leaders. The Urban Bikeway Design Guide was prepared by a team of researchers at the National Association of City Transportation Officials (NATCO) with input from directors of planning, public works, transportation, and urban design from across North America. Urban Bikeway Design Guide is guaranteed. If you are not 100% satisfied, you may return it within 30 days for a full refund.